HOME Minister Sushilkumar Shinde has revived the Snoopgate inquiry issue. NO more 'one for the road.' Buying a drink along a national highway is set to get tougher across the country. Can we hope for change, or is it just carnival time? Recently the Reserve Bank of India gave its approval for granting two new banking licences. This has come after a decade of waiting for new banking licences and though there were many applicants, notably two big industrial houses, the RBI chose to remain cautious and conservative. THE fact that fixations from one's childhood, some of them apparently trivial, remain strong and firm throughout one's life, was brought home to me when I returned to my old school. Old students from the 1930s and 1940s would return and ring my doorbell with some diffidence. Once they had overcome this initial hesitation, they filled the house with stories from their schooldays: a recurrent theme being their fixation to return to the school for one reason or the other. India is a plural society, which has over the ages been witness to a continuous synthesis and where the diverse social, linguistic and cultural elements have more or less been in peaceful coexistence. The Indian movement for freedom bore testimony to the fact that unity and diversity are not mutually exclusive terms; rather nationalism and regionalism correspond to intersecting sects in a Venn diagram. HOME Minister Sushilkumar Shinde has revived the Snoopgate inquiry issue. It is rather late in the day for the outgoing UPA government to act on its decision taken on December 26, 2013, to probe the charges of Gujarat policemen stalking a woman architect allegedly at the behest of Chief Minister Narendra Modi. The incident happened in 2009 and surfaced late last year following investigations by two news portals. The Gujarat government did not deny it and ordered an inquiry since it was essentially a state subject - an individual's privacy being invaded by state machinery. Importantly, the victim did not press the charge, though the state government took the ridiculous stand that it had acted on the instructions of the woman's father. The BJP too procured statements from her father, giving a clean chit to the Gujarat government. The UPA Cabinet's decision to probe Snoopgate was aimed more at squeezing political mileage out of the incident rather than delivering justice to the woman who has never asked for it. The larger goal was, and is, to fix Narendra Modi, who is projecting a larger-than-life image of himself as the BJP prime ministerial candidate. Given Modi's indiscretion, his opponents, particularly the Congress, have questioned his promises of empowering women. Other than causing some political damage to Modi in the ongoing elections, the Congress may not achieve much by reopening the case. Even if the Home Minister has his way and an inquiry is ordered at this juncture to embarrass Modi, the next government may not follow it up. The BJP says it would scrap the inquiry if it comes to power. Thus it may all lead to a waste of time, effort and money. High court judges have more important cases to handle than carry out the political agenda of politicians in power. Former Chief Justice P. Sathasivam has opposed the practice of deploying sitting judges to head commissions of inquiry. Judicial inquiries should be ordered only if paramount national interest is involved and then their reports should be taken seriously and acted upon. NO more 'one for the road.' Buying a drink along a national highway is set to get tougher across the country. In Haryana, it has already become almost impossible, much to the chagrin of the Hooda government that has to swallow a loss of Rs 1,340 crore on account of shifting liquor shops away from the highways. This unprofitable proposition has been made possible by 'Arrive Safe,' a Chandigarh-based NGO which had filed a PIL petition in the Punjab and Haryana High Court for the closure of liquor shops on all national highways. With the closure of nearly 1,400 vends across Haryana on the direction of the court, safety of commuters has been enhanced on the highways with fewer drunk drivers. Punjab and Haryana have implemented the order after the Supreme Court upheld the decision of the state High Court. The decision was endorsed by the apex court in view of a phenomenal increase in the number of deaths in road accidents. From 2003 to 2012, the incidence of accidental deaths on Indian roads has shown an increase of 51.8 per cent, while the population growth during this period was 13.6 per cent. Haryana is placed ninth in the country with 46.2 accident-related deaths per one lakh population per annum, as against the national average of 32.6 accident-related deaths. The value of human life should not be undermined by the governments committed to the agenda of 'development'. The excuse of revenue loss on account of moving liquor shops away from highways is understandable. The governments must ensure that liquor vends are not located along the state highways. Punjab, while agreeing to move the liquor shops from the national highways, has got a "stay for the time being" from the Supreme Court on the removal of such shops along the state highways. More important than the revenue from the sale of liquor is the safety of road users. Governments should be held accountable for their failures to check road accidents. THE volume of business done in the Indian Post Office has been yearly increasing together with the net profits. But the pay and prospects of the hard working employees have not been improved either in proportion to the work or increases in the cost of living. We recently drew the attention of the Government to the hard lot of the postal employees of the Lahore division and hope that their position will be reasonably improved. In this connection it would be interesting to note the improvements effected in the wages of the British postal employees. A special number of the Post Office Circular contains the decisions of the Post-master General in regard to the recommendations of the Select Committee of the House of Commons which last year enquired into the question of the wages and conditions of service of the postal employees. THE pay and prospects of the large vaccination staff employed throughout the Province formed the subject of interpellation in the Punjab Legislative Council. In reply to the Hon'ble Rai Bahadur Bakhshi Sohan Lal, the Hon. Mr. Thompson gave a history of the various changes effected in the conditions of the service. There were in 1901 four grades of vaccinators drawing Rs. 10, 12, 15 and 20. Then came the Resolution of 1908. It did not, the Hon. Mr. Thompson explained, affect the vaccinators' prospect of promotions to a Superintendentship, nor did it affect the present rights of existing incumbents to pension. What the Resolution did, however, was to turn vaccinators into the servants of local bodies, service under those bodies being non-pensionable. Recently the Reserve Bank of India gave its approval for granting two new banking licences. This has come after a decade of waiting for new banking licences and though there were many applicants, notably two big industrial houses, the RBI chose to remain cautious and conservative. Many people wondered why the number of new banks was limited to only two-Bandhan and IDFC — when there were 25 applicants. Perhaps this was because of the RBI's perception that problems in India's banking sector are huge and what is needed is financial inclusion which means more banking services for all, especially for the rural population. 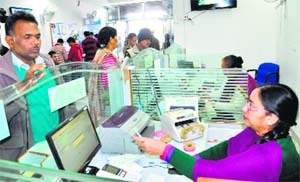 Only 58.7 per cent of households in the country are availing of banking services, according to the 2011 census. Thus 40 per cent of India's 1.2 billion population is financially excluded. The Central government's attempt at greater financial inclusion started since Independence. There have been many initiatives like priority sector lending in which all scheduled commercial banks are mandated to lend to the agricultural and small-scale sectors. In addition, it has promoted the growth of cooperative and regional rural banks. There has also been the formation of self-help groups for providing credit to vulnerable groups. A recent RBI committee on financial inclusion headed by Nachiket Mor suggested that priority sector lending should be increased to 50 per cent of bank lending from its current 40 per cent. Though the credit share of rural areas in terms of number of branches accounts for 30 per cent of the total branches of scheduled commercial banks, the share of actual rural credit accounts for less than 10 per cent of the total credit. Public sector banks have 33.1 per cent branches in rural areas where as the private sector bank branches amounted to just 13.3 per cent of their total branches (March 2013). Banks have been asked to prepare self-set targets for opening rural 'brick and mortar' banks and hiring business correspondents, and offering financial products like basic savings bank deposit accounts (BSBD), kisan credit cards and general credit cards since January 2010. The banks' plans for financial inclusion are closely monitored by a regulator on a monthly basis. As a result, there has been progress. But small-scale enterprises haven't been well served. In my research interviews with owners of small enterprises like making dairy products in Punjab villages and handlooms/handicrafts in rural West Bengal, I invariably found that lack of credit availability was one of the major constraints towards business expansion. Around 90 per cent of small businesses have been found to have no links with formal financial institutions. The 2011 Census revealed that only 5.18 per cent of the units (both registered and unregistered) of MSMEs availed of finance through institutional sources. The majority of units i.e. 92.7 per cent had no finance from banks and depended on self-finance. Needless to say that small-scale sector needs a leg up and financial assistance because it employs a large number of people (59.7 million) and are spread over 26.1 million enterprises. They contribute to around 45 per cent of the manufacturing output and around 40 per cent of the exports. If financial inclusion had been there, this sector would have experienced higher productivity through the use of technology and innovations which they could have accessed through bank finance. Also banking services are concentrated in big cities and India's six largest cities have 10 per cent of India's bank branches, the bottom 50 districts have barely 2 per cent of the bank branches. In cities, migrants are not adequately covered and face difficulties in opening bank accounts. In agriculture, credit to farmers with above 5 acre land holdings accounts for the largest share (44 per cent) of the total credit. For meaningful financial inclusion, banks should give priority to small farmers. Financial inclusion will promote higher savings and will encourage people to start small and micro enterprises, especially women who can then get a regular flow of income and this can help reduce poverty in a sustainable manner. One reason for the persistence of poverty is high interest rates charged by money-lenders, whose presence in the countryside has not been greatly reduced. They are important in financing the purchase of raw materials and even the sale of products and offer personal loans/advances for consumption purposes (weddings, funerals, health costs) to workers in villages. Unfortunately, banking services available in villages have not shown rapid pace of inclusiveness. This is because technology plays a key role in expanding the reach of formal banking services. Banks are increasingly using alternate channels of delivery like ATMs, net banking and phone banking and depending on information and communication technologies to expand their reach. For financial inclusion through digital means, much more needs to be done and adequate infrastructure such as digital and physical connectivity, uninterrupted power supply are pre-requisites for having a proper banking system. In a total of 6 lakh villages, 80,000 villages have no electricity and this works against the proper functioning of banks. Banking services should be in vernacular languages rather than in English because the rural population may suffer from English phobia, making them reluctant to approach a bank. Self-help groups (SHGs) with linkages with banks have been active in many rural areas but have not spread evenly throughout India. The spread is poor, especially in the central and north-eastern regions. Also, certain difficulties have been experienced by SHGs in obtaining bank credit. Recently the retiring Deputy Governor of the RBI, Mr. K.C. Chakrabarty, stated that 'a lot remains to be done on financial inclusion'. Banking to be inclusive would require greater financial literacy and gender equality. All banks rather than 'women-only banks' should include women, especially poorer ones, in their financial services. Perhaps later on, more banking licences would be granted, perhaps even to big industrial groups. Globally it is quite common to permit industrial houses in the banking business and only 12 per cent countries restrict the mixing of banking and commerce. But the independence of banks has to be guarded and assured. Jan Arthur, from the 1940s, returned after a tour of the school, her face flushed with excitement. "When I was seven, Headmaster, I sat on a parapet in the Prep School, with my legs dangling over the edge, looking up at the stars and promised myself that I would grow up to be a nurse. I would then return one day, sit at the same place, dangle my legs over the edge and look up at the stars. It took me 56 years but I finally did it today." Norman Kells, head boy, 1933, came back to the house repeating over and over again: "I found it. I found it." 'It' was a puddle into which his Maths teacher had flung his exercise book, when he had done a particularly bad piece of work. It had motivated him to work his way to the top of the class. He had returned now, to find his puddle. I did not point that in these 66 years, the hollow that had created the puddle must definitely have been filled up. Fred Adams and George Browne of the 1944 batch had done a lot of things together, but when it was time for them to leave, they realised that they had never climbed up to the Gorkha Fort: a popular destination for short treks. They vowed that they would come back and do this. They returned in 1997 and fulfilled their promise! "The only home I knew was my school. I have always wished, even as a child, to be buried there. Do you think that is possible?" I didn't know what to say. The warden informed me that those who had committed her, had specifically stated that she be cremated — possibly to save themselves an expensive and unnecessary trip to India. I did write to the then authorities, giving all the details. I don't know what eventually happened. But I like to feel that her fixation, like the fixations of the others, rooted as they all were in their beloved school, did find fulfilment: that her ashes lie buried at the base of one of the majestic pine trees in the school graveyard. India is a plural society, which has over the ages been witness to a continuous synthesis and where the diverse social, linguistic and cultural elements have more or less been in peaceful coexistence. The Indian movement for freedom bore testimony to the fact that unity and diversity are not mutually exclusive terms; rather nationalism and regionalism correspond to intersecting sects in a Venn diagram. Many regions like Bengal and Punjab were in complete unison whilst participating in the national movement for freedom, but at the same time were proud and passionate about their respective cultural distinctiveness. Though over the years, the notion, that nationalism and regionalism can be promoted only at the cost of each other came into play. The connotations for nationalism changed the shades from “We are one” to “We are the same” which did not go down well with a number of regions. The chagrin generated by this change of notion led to the birth of regional parties which started pitting themselves against national parties and vice versa. The imposed uniformity was met with resistance in most regions, and in some coupled with other factors, it became fodder for conflict zones. 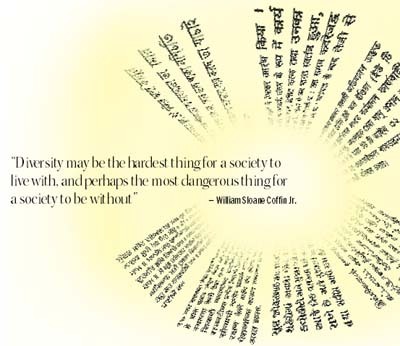 Both unity and diversity became victims as diversity in the form of philosophy, literature, music, dance, cinema, handicrafts and sculpture can only flourish in an atmosphere wherein differences are celebrated and where cultural issues are not centrally manipulated and controlled by a few people or by the dominant culture. Dominant culture normally encourages people to choose safety over risk and sameness over diversity and that is what has been witnessed across the northern part of the country. The imposition of one language and one culture by diluting or denigrating others has dangerous political implications and has changed the milieu of the northern part of the country. Socio-political fatalities also caused a vast economic impact as they wiped out local enterprise. Every dominant culture has a nucleus which organically becomes the hub for economic, cultural, academic and mass media pursuits and for all kinds of development whether infrastructural or intellectual gets concentrated around the same. Moreover, it becomes an investment magnet and starves the smaller regions of the same and hence leads to lopsided growth. The dominant nucleus naturally attracts talent, intellect and capital from all regions thereby further diluting the cultural, intellectual and talent gene pool of those regions. The regional language and culture gets suffocated or slowly merges into the dominant language, environment and culture, thus either marking its own end or beginning of a non productive existence. The capital, talent and intellect drain not only stalls the financial growth of the regions from which the efflux takes place but also causes infrastructural, logistical and environmental problems due to over population in the hub of dominant culture. Now, the question that arises is, whether anything has been or can be gained from “sameness”? Is unity a natural corollary of dwindling diversity? 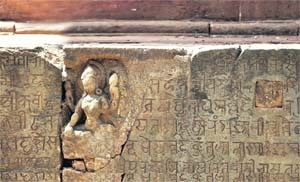 According to the People's Linguistic Survey of India (PLSI), a private endeavour, the country has lost nearly 250 languages and dialects in the last 50 years, and the same number of indigenous cultures associated are likely to have vanished as language forms the backbone of any indigenous culture. Apart from the languages that have become extinct, there are several others that have been diluted to an extent that they fail to be a source of wealth both culturally and economically and are dying a slow death. Can we say that the country has become more unified or more tolerant than it was sixty years ago? The answer is most likely “No”. So, it can be inferred that, the view that had been promulgated over the decades, that diversity and unity are indirectly proportional to each other, does not hold much water. So does that mean they are directly proportional? No, rather they are independent of each other because unity emanates from patriotism, tolerance, acceptance, a sense of belonging and above all a sense of purpose. These qualities have disappeared even from homogenous sections of society. A less diverse, but not a more unified country, that’s where we stand today. The portrait of India has fewer hues and a lot many are fading away or being watered down. But, is the brush carrying regional culture leadership, if at all it exists, filling in any new colours? The quintessential example of a watered down culture and language is that of Punjab. There has been dissipation of the shared values, beliefs, customs, jargons and languages along with its colloquial phrases and subtexts. Prior to India’s independence, Lahore, besides being the administrative capital of Punjab was also the cultural, culinary and fashion centre which also earned it the epithet “The Paris of East”. Post Partition, East Punjab lost Lahore and till date, is without a cultural capital. Outside Punjab, the second and third generation Punjabis living in cities like Mumbai are completely removed from “Punjabiat”, the only remnant being their surname. In Delhi, written Punjabi has vanished and spoken Punjabi will also meet the same fate soon. Same is the case with those settled down in other non Panjabi speaking cities like Meerut, Karnal, Lucknow, Kanpur, Jamshedpur and Kolkata. This is an archetypal example of the above mentioned slow merger into the dominant environment, which along with the language and literature has gobbled up even the traits and nuances, leaving behind a few, that too, not the pleasant ones. It is likely that a minority adapts to the culture and language of the majority but the declining readership of Punjabi publications and the recent discontinuation of Punjabi journalism course in Panjab University, Chandigarh, for lack of students, tells us another story; that of the fish drowning in the sea. Just as a fish drowns and dies even in the sea if the latter is not oxygenated enough, the Punjabi language and culture is gasping for help in its own land. The truth is that even in Punjab, spoken Punjabi is also restricting itself to a certain geographic, age and gender demographic. 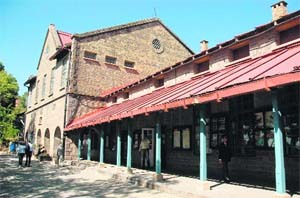 The nucleus of the much larger contiguous belt, also the capital of the country has been and continues to attract Punjab’s intellectuals, writers, academicians, literati, artists, chefs, photographers, designers, sportspersons, curators and many more, making the former creamier and the latter drier. Moreover, the absence of a cultural nucleus imparts velocity to the drain. The culturally more vibrant and intellectually richer nucleus of the dominant belt attracts more infrastructural investment, tourism as well as business, which again attracts more talent, intellect and capital, thus the cycle goes on and for the smaller region the crisis deepens. Both the extent and effect of the crisis is reflected by the list of people fleeing to Delhi. It includes kith and kin of businessmen who move out for want of more dining out /lounging options and A list shooters, who in spite of a world class shooting range in Patiala and plum posts in the state police force, decide to reside in Delhi. The list also features political leaders and representatives who thump their chests and swear by their “Punjabiyat”, get elected by Punjabis to put Punjab’s economy on track but they themselves “contribute to its economy” by shifting base to Delhi! The contrast to the above watered down culture lies in the southern region of India. They might have been criticised initially, but their resistance to the dominant language and culture has paid off both culturally and economically. Their choice to welcome the medium of instruction but resist the dominant language has also reaped rich academic and business dividends. The C.V Ramans, Narayan Murthys , Satya Nadellas and C N Raos testify the same . The Rs 15,000 crore film and television industry tells the region’s success story. The industry has in place infrastructure to take care of all processes that go in for filmmaking, from pre production to post production and marketing. Another commendable aspect is that all the four states have held on to their cultural and linguistic identity despite being contiguous. In contrast stands the pale Punjabi film and television industry, not because of talent deficit but talent drain. Since the 1940s many Punjabis have been making a beeline to the Maximum city, never to look back, and rather, have submerged their identity in the melting pot. Not only have Punjabis made great Hindi film makers, technicians and actors but also avid viewers. The top grossing films in the East Punjab circuit are all Hindi language films. Punjabi films though, of late, have been able to shake the monopoly of “Bollywood” to some extent in the East Punjab territory but whether the trend continues will depend on the content and versatility of the films. The TV scene though remains dismal, even the few popular channels that are in the fray, are run not from Punjab but Delhi! Post independence, no city has been able to become the cultural, academic or media centre in Punjab. Delhi, Mumbai, Chennai and Kolkata were big political, economic and cultural centres under the British ruled India and they continue to be so even today. But the moral of the story lies in the new names that have assumed significance post-independence and no guesses, they all come from a certain part osf the map of India. If the strength of India lies in the 5Ts, the strength of these Ts i.e. talent, tradition, tourism, trade and technology lies, directly or indirectly, in the number and distribution of cultural hubs. The tourism industry is a gold mine and the latent tourism potential can be tapped by investing, developing and promoting such cultural hubs. Everybody would like to walk into a garden with many flower beds of different hues rather than a garden with some half empty and some over grown and crowded ones. * The first Linguistic Survey of India was carried out between 1894 and 1928 by George A. Grierson. Conducted by teachers, it referred to 733 languages and dialects. Lack of trained linguists led to several deficiencies in the survey. * Post-Independence, the Government of India initiated the first linguistic survey during the Fifth Five-Year Plan in 1984. It is yet to be completed, with only a part of the mandate having been achieved in 2010. * A revised Linguistic Survey of India was initiated as part of the Eleventh Plan under the Central Institute of Indian Languages, Mysore. The project was expected to involve over 54 universities, 2,000 investigators and 10,000 linguists for over a period of 10 years. The work on it has not commenced so far. * The Dar Commission (1948) and Dr B R Ambedkar had endorsed the formation of linguistic provinces in independent India. The States Reorganisation Commission report (1955) suggested it’s not desirable to reorganise states on the basis of the single test of either language or culture.